"Mr. Veltliner," as he is called, as 95% of his 30 ha are planted with this variety. Ott is a giant of a man in stature physically, but also in terms of his international reputation, exporting to 15 different countries. Biodiversity and biodynamism are what he preaches, but as a means to an end, which is to produce the best wines possible. It doesn't hurt to have a great terroir, and Wagram is particularly blessed with mineral-rich loess soils which can be 20 meters deep. These loess drifts were deposited in prehistoric times by violent wind storms and they are particularly kind to Grüner Veltliner. Pre-tasting at Ott's vineyard. (L to R, foreground): Frank Smulders MW, Bernhard Ott, Ott's marketing director. These were my favourite Veltliners, mineral wines with many fruit and spice nuances, and alive with complex acidity. It was here where I learned that the "sour milk" smell I get from Veltliners is not due to malolactic fermentation but is a natural component of GV's bouquet, as it was clearly evident in "Der Ott" 2008, which did not have a malo. The 2007 did, and was also more complex. "Rosenberg" comes from a deep loess site and is meant to age several years in the bottle. 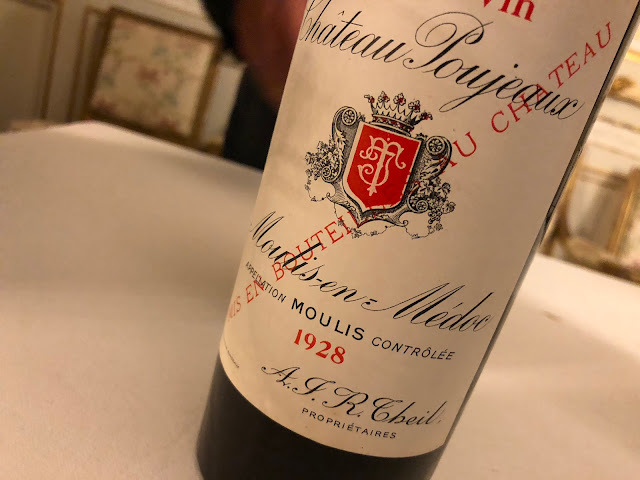 This was evident as we tried the last three vintages: the 08 was a bit alcohol-rich, the 07 was already better, lighter and more elegant, and the 06 was rich with lemon and tropical fruit with floral tones, beautifully thick in the mouth with a long aftertaste. Ott's marketing director confirmed that there was a cowhorn buried somewhere in the vineyard, but wisely wouldn't tell us where it is. 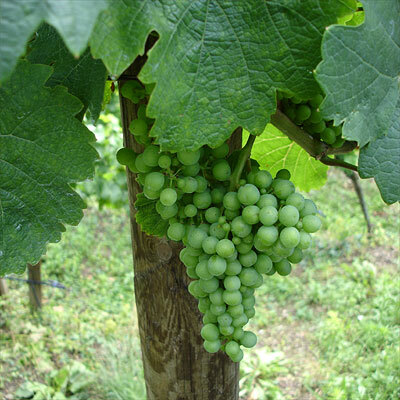 Wachau is famous for its Rieslings, even if this grape only represents one-eighth of all plantings. The region has embraced Grüner Veltliner, since unlike Riesling it has no competition from Germany. 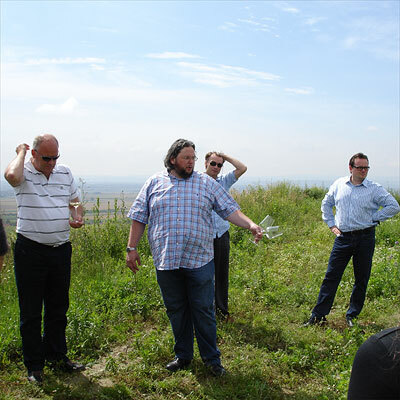 Hirtzberger has 20 ha of mostly terraced vineyards on granite and slate soils rising steeply from the north shore of the Danube. As in the Rheingau in Germany, this creates perfect conditions for Riesling, which thrives on slate's high mineral content. 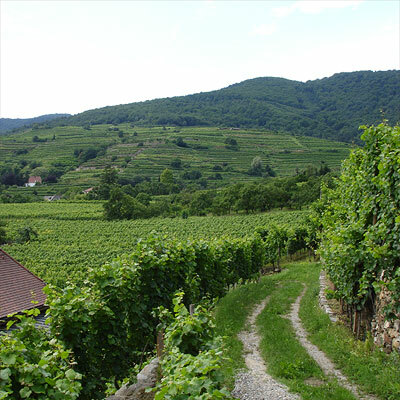 Hirtzberger's terraced vineyards in Spitz, on the north shore of the Danube in Wachau. There are three styles of white wine in Wachau. Steinfeder is made from early harvested grapes to provide a lighter style dry wine with crisp acidity. Federspiel is medium-bodied, and Smaragd is a powerful wine made from late-harvested grapes. The top Riesling tasted here was the "Smaragd Singerriedel" 2008, a powerful wine with great minerality. A special mention goes to the "Smaragd Honivogel" 2008, a benchmark for Grüner Veltliner in its own right, very full and fat, showing great promise despite having been bottled only at the end of April. The Hirtzbergers are passionate about Austrian wines and are eager to know how it goes with their fellow vintners. This was confirmed by a look in their glass dumpster, which was filled with empty bottles of vintages from all over Austria. Bründlmayer exports 35% of its wines to 27 different countries, making it a truly international winery. We were guided by the very knowledgeable and enthusiastic Thomas Klinger, Marketing Director for the business. Bründlmayer's vines at the Heiligenstein, in Kamptal. Bründlmayer's success can be attributed to its 12 ha (more than one quarter of all plantings) on the Heiligenstein, the crown jewel of the Kamptal, as close as one gets to a Grand Cru in Austria. This is a hot micro-climate (it was originally called "Hellenstein", because of its hellish daytime highs). The varied sandstone, mica, slate and volcanic soils, as well as the cool night-time temperatures, produce tremendous white wines of character. We tasted extensively here from a broad range of styles. The 2007 "Zöbinger Heiligenstein Lyra" was a magnificent Riesling, with a flowery pollen and acacia honey bouquet. mineral and beautifully dry. The 2002 and especially the 2001 were touched by botrytis, resulting in slightly sweeter wines with less acidity. The 2008 "Alte Reben", made from Grüner Veltliner, had great white fruit concentration and white pepper, along with what I call the GV sour milk in the bouquet. I was impressed that the 2002 still had very crisp acidity, a sign that Veltliner is a white wine with true ageing potential. Bründlmayer also makes Eiswein, and according to Klinger, harvesting in November is attractive to forego the problems of rot and bird predation. Since the harvest temperature is set at -9° C by Austrian law, I (as a Canadian) have trouble seeing how this is possible, since even in Canada icewine harvests usually take place in January. Austrian red wines are even harder to come by on the export market, but the best ones come from the Blaufränkisch grape in Burgenland. This little-known and underrated grape prefers heavier loam soils and the hot continental climate of the Pannonian plain bordering Hungary, where Blaufränkisch is known as "Kekfrancós". In a simpler style, these are tasty fruit driven wines, not unlike Sangiovese, with dark cherry fruit, medium-high acidity and medium tannins. Everything we tasted at Wellanschitz was an honest expression of Blaufränkisch, and refreshingly good. Their "Blaufränkisch Reserve Well" 2006 showed this grape’s potential: a deep wine with spicey caramel, dark cherry and chocolate. Blending with Bordeaux varieties is common here, as could be tasted in the "Fraternitas" 2006, which contains 30% Cabernet Sauvignon and a darker, cassis-like flavour. Wellanschitz is a true (6th generation) family business, and they enjoy drinking champagne, so they make their own Blanc de Blancs from Chardonnay vines "because it's cheaper to make it than buy it." Krutzler is a fifth-generation winery and considered by some to be Austria's best red wine producer. Their 12 ha of vineyards are concentrated in an amphitheater of iron-rich loams sheltered by forests on the Pannonian steppe. Hungary is clearly visible in the distance, but as in St. Emilion, this iron-rich soil produces red wines with great mineral character. Krutzler must see the similarity, as their Merlot 2007 had a right-bank concentration. The Blaufränkisch wines go further though. The 2007 Reserve had even more fruit than the Merlot, with a darker character. And the flagship wine is the "Perwolff". The 2007 was a dark-fruit bomb, with full but soft tannins to back it up. It was amazing to taste Blaufränkisch at this level, for Krutzler would be a first class Grand Cru if Austria had such a classification system. 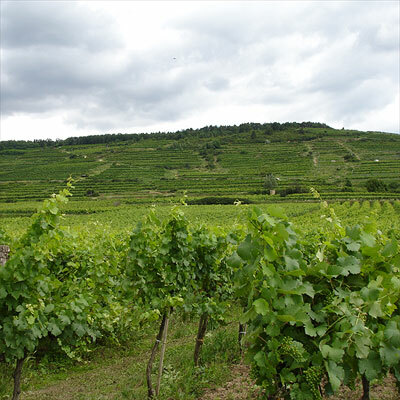 A curiosity of Südburgenland is the Uhudler grape, a vitis labrusca variety used to make rustic rosés and brought over during the phylloxera era in the late 19th century. Say it out loud: OO-HOO-DLER. It's not very good. Young Gelber Muskateller (Muscat) grapes, used to make a locally popular light and fruity summer wine. Nice to read it, so clearly and to the point. Enjoyed the trip enormous. Great story about your trip to Austria. I went to Austria this past June on a trip sponsored by the Austrian Wine Marketing Board. I left astonished at the variety of wine Austria has to offer, and of course at the beauty of Austria's wine regions. Good to see someone else enjoying this beautiful country's bounty.